I’m back from a fabulous trip to the mountains 🙂 You may have caught some of our vacation photos on Instagram. We spent the week in Bass Lake (near Yosemite) and stayed in an amazing log house with my parents, my bro and his family, and a family friend. It was really fun to be unconnected for the week and have some fun outdoors. 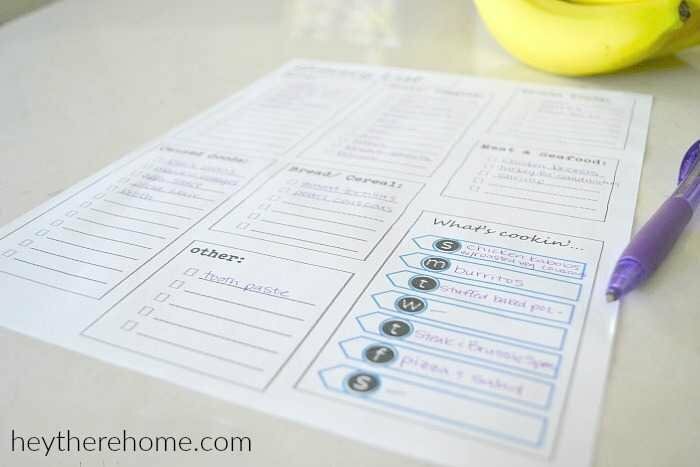 But today I am back to reality and when I headed to the grocery store to fill our (very empty) fridge this morning I realized that I never shared this easy Grocery List Printable and Meal Planner that I’ve been using for a few weeks now and loving! Coming back from vacation always makes for a really interesting first morning when there is not an ounce of fresh fruit to be found. So this morning when the hubs and I started digging through the freezer for some options only to come across old baby food that I made before discovering a baby food recipe book that could do no wrong, among other no longer edible items, I decided to make a list for a big shopping trip that would get us back on track to have some easy meals on hand. 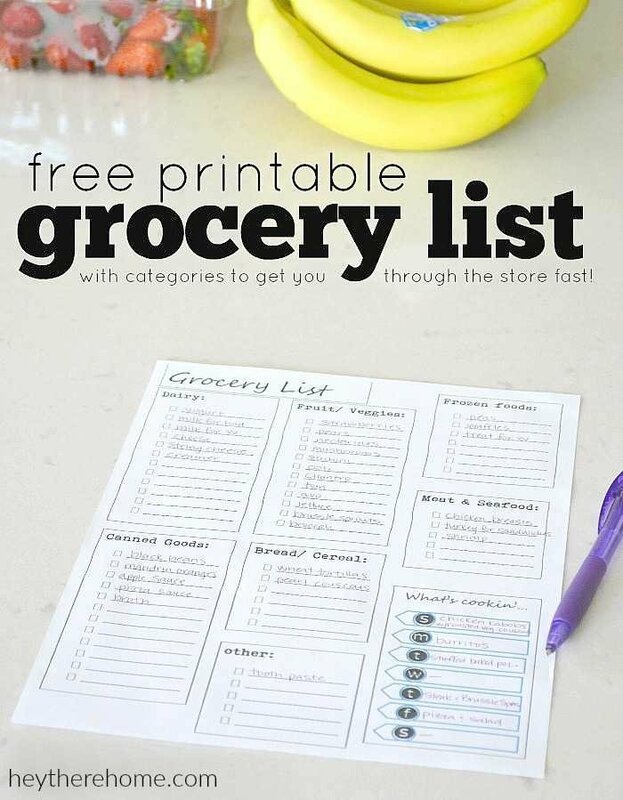 Like I mentioned earlier, I made this printable grocery list and meal planner a few weeks back, but I couldn’t share it with you before testing it out right? Well, believe me, it works great! First I think of the meals I want to make that week, and semi plan out which nights will be left over nights or nights that we eat out depending on our schedule that week. Then I go through each meal and write down what we will need and put it on the list in the correct category so that when I get to the store, everything is on the list more or less by aisle, which makes getting in and out of the grocery store so much faster. And since, I’m so thankful to all of you guys for taking the time to hang out here, you can have as many copies as you want for free! Taking the time to be organized before I go to the store has helped me spend less, waste less, and not buy things that we don’t really need. It also makes grocery shopping, one of my least favorite chores, so much faster so I have time to tackle other stuff on my weekly to do list and still have time for some fun! I hope this printable helps you do the same! I love this grocery list, fits my family perfectly! It made helped us not over buy and we didn’t forget anything we need. I lobe the “what we cooking” area! Yay Liz! So glad you’re finding it useful for your family! My daughter and I use this shopping list and it works great. Thank you for sharing such a wonderful idea. I’m so glad you’re enjoying the list, Shirlene! Thanks for letting me know! I just hopped on google to look for a list and found yours to be exactly what i need! Simple and to the point! Thanks!!! Great! So happy you found it helpful, Lisa! I’ve been looking forever for good meal planning and kitchen management tools for the maternity home I run. Your site is great! Thank you so much. Thanks for the resource, Corey! Another big Thank you for making up this printable – I love the little tick boxes! If I’m not careful I walk out of the store without all my items…….I will definitely use this! Pinned it! I am using an IPad but when I click on the download for your free printables, all I get is a blank page. Any suggestions? Thanks so much! I can’t wait to try this shopping list. This is a wonderful grocery list. We love it!!! Thank you so very much. I have been searching for one and just couldn’t find one to fit our family. This is perfect. I’m so happy that you like it! Definitely a must to be prepared ahead of time, especially if you have kids right? I really hate grocery shopping… this will keep me focused, and out of there sooner!! Thank you very much. That was exactly what was happening to me. The older we get the more limited out time is so being efficient during one of my least responsibilities (grocery shopping) was a must. Let me know how you like it! This is awesome Corey- I love how you added the little corner with the days of the week for dinner- perfect!! Pinned and sharing! This definitely beats writing the list on my hand or sending myself or the hubs multiple text messages, lol. Thanks for sharing! Oh, I SO love this grocery list! Thanks for sharing! I forget that you live in CA too. We love Yosemite! We had a blast! I hadn’t been there since I was little and it was so fun to see my kids enjoy the same fun stuff we used to do! Thanks so much for sharing this printable with us!!! Thanks so much, for a simple list that hopefully makes my shopping trips quicker! You are so welcome Debbie! I made sure to make it easy to print (not a lot of color) and I’ve been using it for a few weeks and love it! Happy (quicker) shopping!